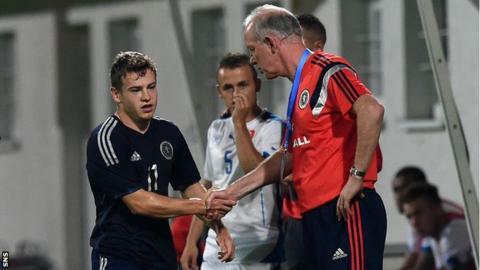 Scotland Under-21 coach Billy Stark admitted the 1-1 draw with Slovakia was "heart-breaking". The result ended the Scots' hopes of reaching the 2015 European Championship in Czech Republic, as Slovakia cemented second place in Group 3. Ryan Fraser put Scotland ahead only for Ondrej Duda to level in the final minute. "The performance the players put in tonight deserved a victory," said Stark following the match in Senec. "They got back the determination and resilience to defend properly against a good side with a real presence. "We countered intelligently and created good chances. There were lots of good individual displays but collectively they really showed they were a team. "The midfielders showed they could do both parts of the game well. "We'd trained to get Ryan Fraser and Stevie May through on them and that happened on numerous occasions." Stark felt luck had evaded Scotland throughout the campaign with his side going into their eighth and final match against Luxembourg with eight points on the board. "With a young group we can take a lot of heart," added the coach. "We can improve on focusing on the game - not just thinking about playing - but on how the team functions and what can work for us. "Looking at this campaign you're searching for that wee bit of luck at the right time. We've never really found that."